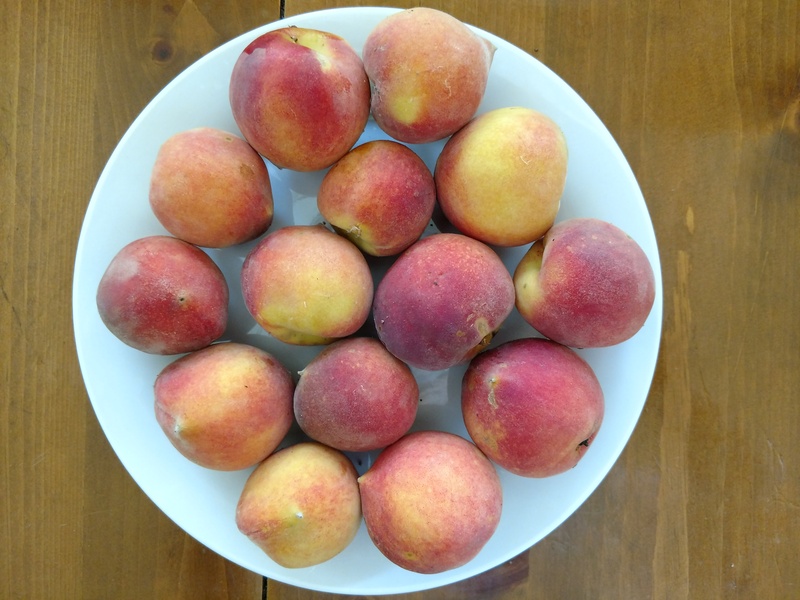 Our Peach tree produced an unusually high yield this year – and the birds were not trying to sample the ripening fruit (very unusual, but maybe that was because the bird feeder near the house is kept stocked for them). The total amount harvested was 30 pounds of fruit; small peaches – each about 1.25 to 1.75 inches in diameter). About 7 pounds of that total yield was seed and soft, rotting portions of peach. We don’t have freezer space and I don’t want to can these, so we are trying to use dehydration for storage. 1) Cut peaches in half (leave skin on, remove pit—fairly easy to remove from cling-free peaches). Also, cut out any rotten or bad parts, but keep the firm, brightly colored portions. 2) Drop peaches in boiling water to blanch for 30 seconds. 3) Remove and briefly allow peaches to cool to touch. 4) Place on dehydrator trays, skin side down, and dehydrate for 12 to 14 hours at 115 to 125 degrees Fahrenheit. 5) When the peaches appear somewhat flattened, and are flexible enough to bend without cracking and revealing moist fruit (may take up to 15 hours if the temperature is on the low side), then press your thumb into the center of the skin side and gently push until the shape is reverted (curve side in for the skin side). 6) Continue dehydrating for another 10 to 12 hours (depends on the size of the peach halves) until flexible, but no longer sticky to touch. 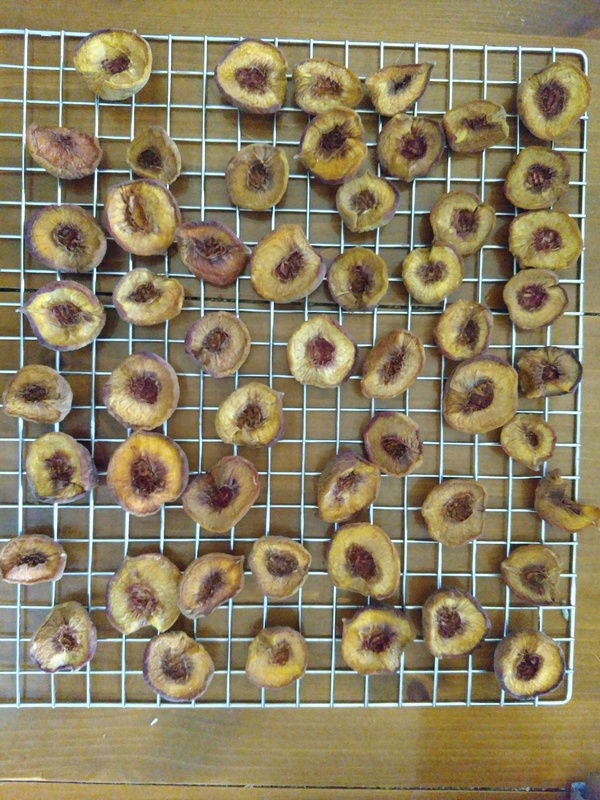 Dried peaches make a great snack, or they can be cooked for pies or kolache! (Cobblers are better with fresh peaches, but dehydrated peaches may be used if they are first cooked on the stove top). Fall is a good time to plant fruit trees to allow them to develop roots before they begin to grow in the Spring. Keep in mind that Peaches require “chill hours” in order to produce fruit. In zone 8b, we look for a variety that requires 250 or fewer chill hours — check with your local Extension agent to learn more about Chill hours and peach varieties that are suitable for your area. 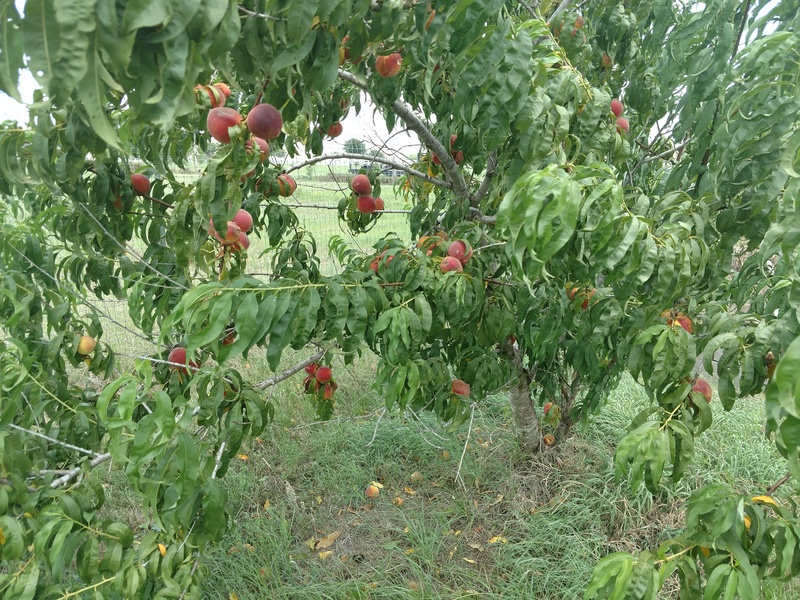 The Peach tree described in this blog post requires 500 chill hours – this tree was sold at a local box store, and they may not be aware of the needed hours for the local area. As a consumer, select varieties suitable for your area.